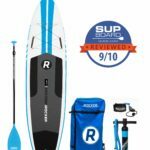 Note: iRocker just launched their 2019 models and the 2018 boards are no longer available. Check out our review of the 2019 All-Around here. The new and improved 11’ All-Around for 2018! iRocker has tweaked a few things, and it’s obvious there is an improvement. There’s been an upgrade in design and materials. There is also improvements on some of the accessories as well as some new ones now available! Much the same as the previous years, the 11’ All-Around is a fantastic board that performs extremely well in various conditions. 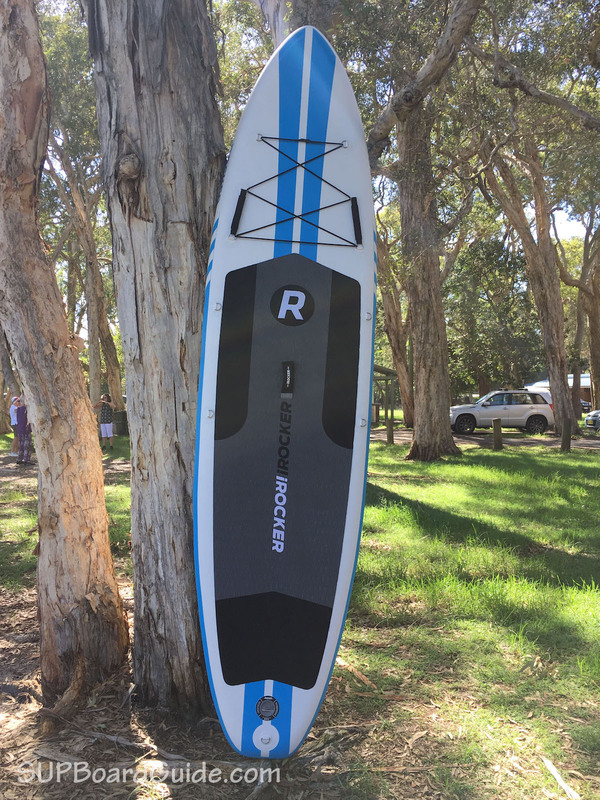 It may not be the perfect surfing SUP but put it in various conditions elsewhere, like choppy white caps or open water where you want speed..and you’ll be surprised how well it handles the variants. Specially made for bigger riders or those taking extra passengers, it’s a fantastic option as a family board to be shared around. Find out more in detail below! Let us know what you think in the comments. Are the video reviews helpful? Even though I was distracted by the striking new design on the All-Around, I still was able to focus enough to get a good gauge on the performance. I took the 2017 model out and quickly followed on the 2018 to get the best feel for both. 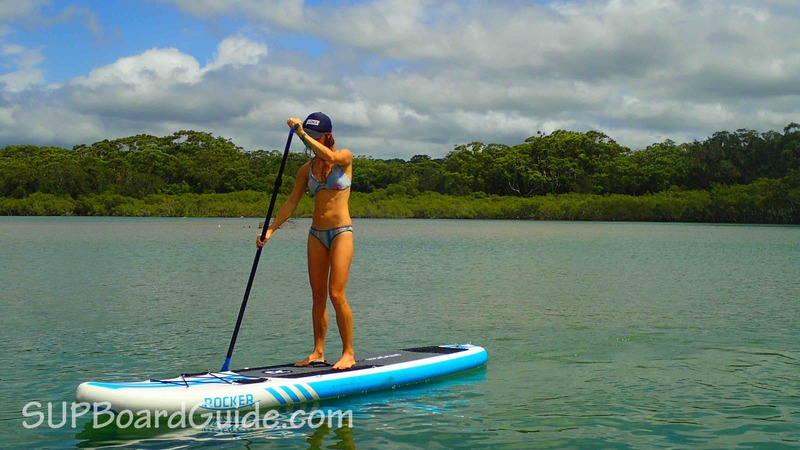 Taking SUP’s out in all conditions does give the best result, however, the majority of where people go is flatwater. So, the following is explained as what I felt on the river. The increase in materials does give the board more stability, and it feels more rigid under your feet. I found I felt the difference when I was just casually paddling, trying to get my speed up and when I found myself in some choppy currents. When I was turning and trying to do some donuts in the water like the cool kid I am, I didn’t notice much difference in the turning. The All-Around has a nice rounded tail which makes pivot turning sleeker than on the wider tail boards like the Cruiser. Additionally, the 3 fin setup provides stability while also helping cut the water when you turn. A huge single fin acts as a tracking tool. The curved shape helps with propelling you through water and keeping a straight line. This ultimately plays out in your performance by helping gain speed. If you don’t understand this, take the single fin out and see how you go. You’ll be zig-zagging more than your favorite player en route to a touchdown. Now the speed is where I did feel a slight change. The new 2018 is slightly slower than the 2017 due to its heavier materials. Though, it’s such a small difference I almost wasn’t going to mention it. Sometimes you may feel like taking your SUP in the surf, while I can’t recommend you take this All-Around into beach breaks, you’d have fun on small point breaks. Once you are out the back and lined up, you zoom down the face, and there is definitely enough give in the tail to turn into the wave adequately. Though if that’s what you really want, so long as the weight capacity of the 10’ suits you, I’d highly suggest getting one of them. 11’ boards just aren’t made for easy surfing. Where this new 2018 model excels is as a family board. Why? The introduction of handles on the bungee cord for extra passengers to hold onto as well as the extra weight capacity. Aside from those things, the stability and versatility of performance means this is an ideal beginners board. 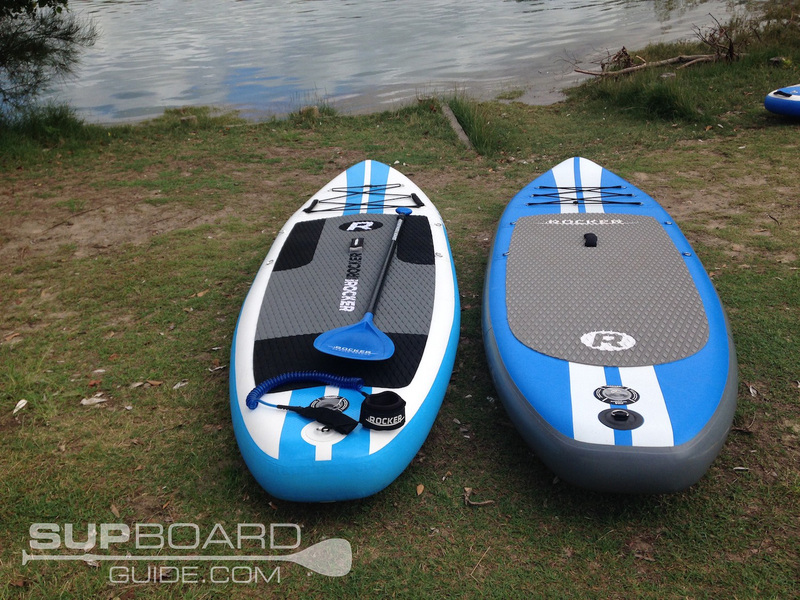 Seeing as your whole family won’t probably be keen SUP riders already, being able to share a board around that suits the bigger men as well as teenagers, will save you money and time! 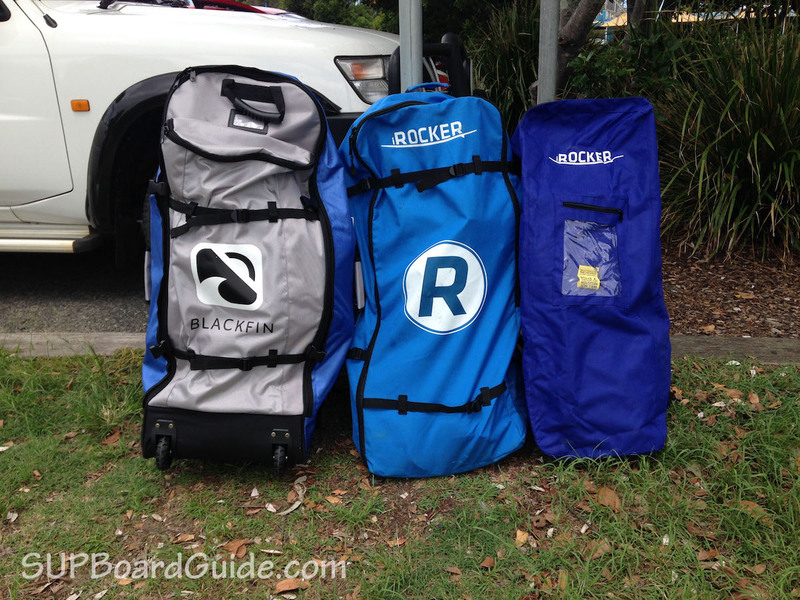 The new Blackfin boards by iRocker are also worth mentioning. 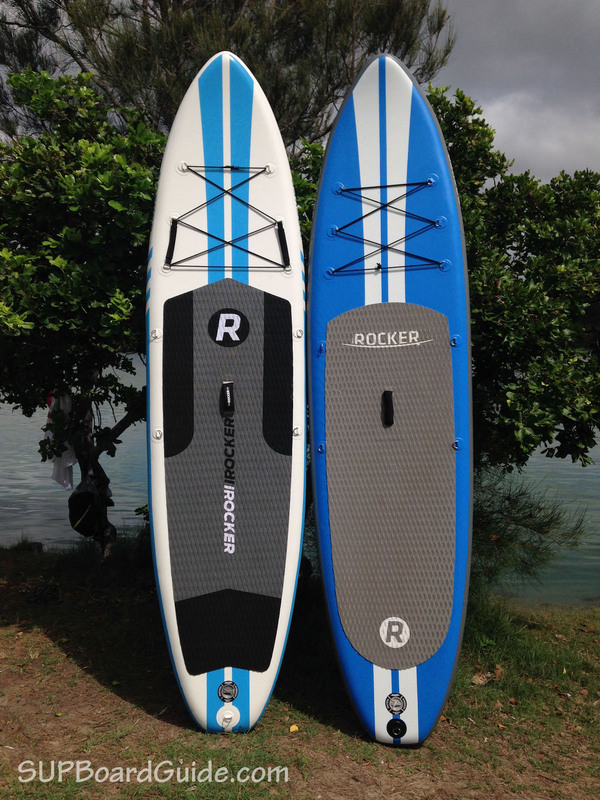 Blackfin is iRocker new premium line of boards and the Model X is fairly similar to the All-Around. However, everything is just a tiny bit better. You get carbon rails, a carbon paddle, an extra cargo area, an improved backpack and much more. At the time of writing this review the Model X is just $100 more expensive than the 10′ All-Around and around the same price as the 11′. That’s exceptional value and I’d recommend you check out the new Blackfin as well to make sure you don’t have any regrets later on. You can find it here or read my review here. 2018 Update – New design down the rails and over the deck. New color schemes. The materials have been upgraded, and there are extra handles on the nose. Fishy fishy in the sea! There are gills on that board! The new design, in my opinion, looks much better. It’s totally remade the board. It gives it a sleeker look and more modern. Simple and minimal. Which is kind of “in”. You can see the new design through the rails where the idea of gills come from. The deck pad has also been improved to now be a crocodile skin texture as well as keeping its diamond groove pattern. On top of the new deck pad materials, it’s also got a new color scheme, which is dependent on the overall color choice of your board. A new feature; the 11’ All-Around comes in 4 colors! The usual blue, the sea-foam delight, crispy whites and elegant grey. Your paddle also matches your boards color now! Any more features? Yes. There are some new handles, which also can be removed if you desire. They are on the front, placed on the bungee cord that’s threaded through the D-rings. They are for your extra passengers to hold onto. Now you’re noticing that you’ll also notice there is a large space for your gear to be stored on the nose there. There are additional D-rings on the center for attaching the optional purchases of a kayak seat or the carry strap. Finally, a D-ring at the tail for your leash. The upgrade in materials I’ve mentioned refers to the extra layer of PVC. Where before iRockers All-Around (and all their other boards) had a triple layer PVC, the 2018 range now is made with a quad-layer. The reasoning is to improve rigidness, stability, durability and weight capacity. It gives the board a bit more value. There has been an increase in weight because of the extra layer but only a mere 3 lbs. 2018 Update – The fin box has been improved. The flip lock fin is incredibly easy to install/remove. All-Arounds should all have the option to have removable side fins. Just saying! Being able to use your board as just a single fin when on calm, open water conditions gives it extra speed and tracking abilities. Then you can still put the side fins in for choppier conditions or if you feel you need the extra stability. Though you can’t remove the side fins, the setup is still adequate and easy to use. Seeing as many beginners will start out on an All-Around too, it makes sense to keep the side fins for that stability I mentioned. The center fin is removable and easily done so with a quick flip on the lock. Can’t express how easy and simple it makes the setup/pack down of your board. If you paddle most days and are packing your board to do so every time, the ease of setup does make a big difference. The valve located at the back works efficiently. Sometimes the cheaper boards use cheap valves that can leak, or it’s difficult to secure your pump hose into them. Never had that problem on any iRockers. A full inflate takes 5-10 mins (15 PSI is ideal) depending on the effort you put into it! Make sure the pin is in an upright position for the inflate. When you are ready to pack up, push the pin in and twist it to keep air being allowed to push out as you roll up your SUP. Just remember to push it back out again before inflating next time! 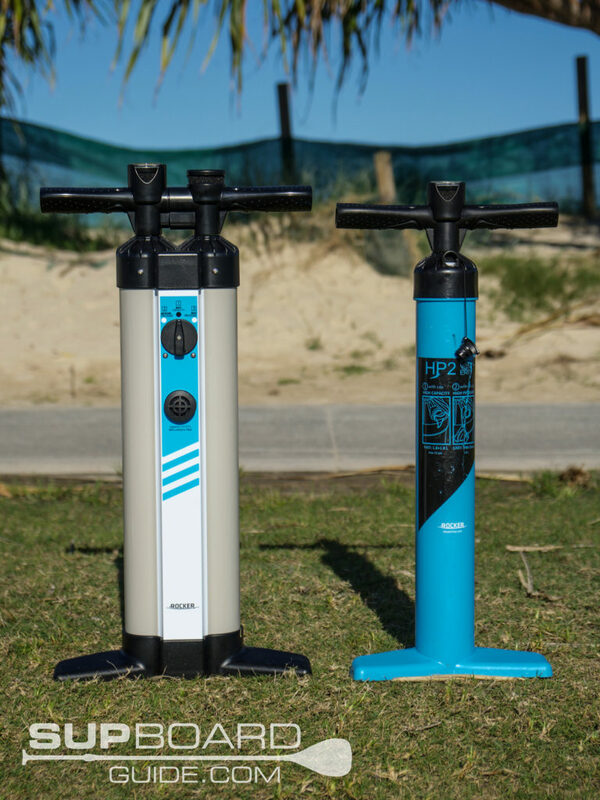 Update: iRocker released a new pump in 2018 and it’s awesome. It’s by far the best pump in this price range. 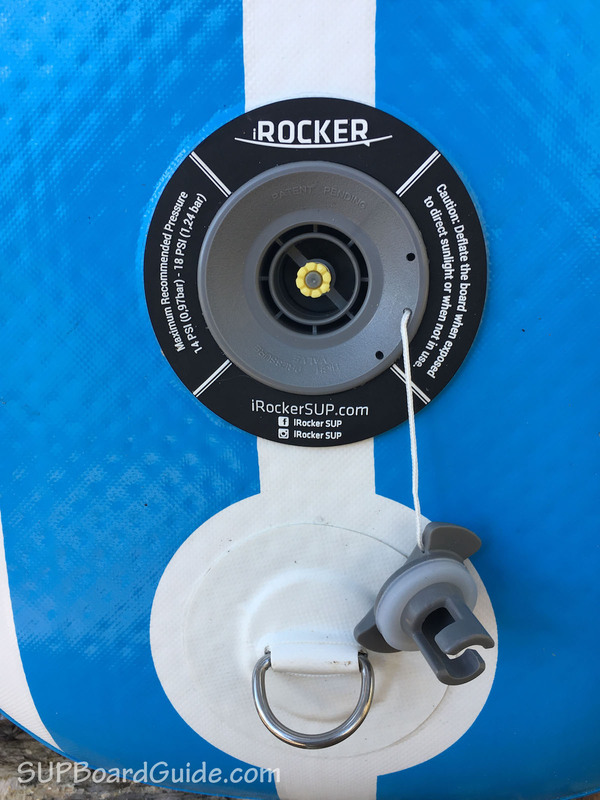 While others offer dual action, iRocker added a second chamber making pumping your board up way faster and easier. Check out the picture below. You’ll receive the same fiberglass paddle as you did in 2017. There’s no need to upgrade it as its a particularly good paddle for this price range! There are carbon fiber paddles for sale if you choose to start getting more serious about your paddling. 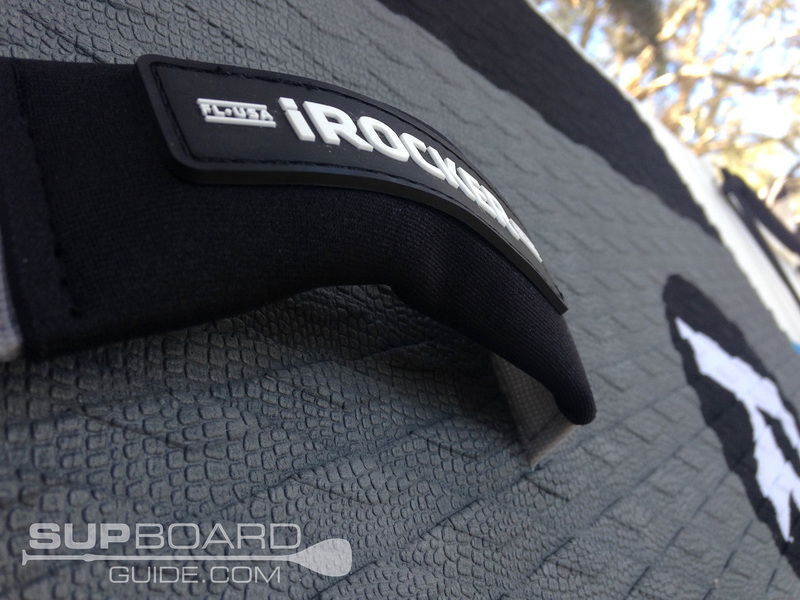 All Blackfin boards, iRocker’s bew premium range of boards come with carbon paddles. You can read the review of the Model X, which is fairly similar to the All-Around here. Given that they are only slightly more expensive than the iRocker range, I definitely recommend you check them out as well! This fiberglass paddle you receive can now be adjusted to 86” whereas the 2017 models were 79”. Making taller people’s lives easier! Super simple double pin lock to adjust heights that means there’s no chance of putting the handle in crooked! It also breaks down into 3 pieces and easily stores in your backpack for convenience. On the handle is a nice rubber grip and the lightweight nature also adds to your comfort. Durability is also important which is why the blade has been made with a tough edging to push off objects if you need to. While the color coding is purely aesthetic, it’s these small differences that add the value in my opinion. I love going out matching with my paddle and leash. It’s almost as good as those days you realize you’ve managed to match your underwear. Your dual action high pressure gets the job done better than most pumps in this price range. It’s sturdy even under pressure. The pressure I refer to is me after too many coffees and no patience to get in the water. It’s got the dual action option so you can switch between inflating on both up and down pumps or just the down action. The single action makes it easier to keep pumping when you reach the higher PSI levels. Easy to read integrated pressure reading on top means you can keep an eye on your end goal! Your high-quality coiled leash now matches your board and paddle! It looks so good too! The coiled leash reduces the snapback of your board as it can stretch much further than straight ones. You can also find a key stash spot on the comfortable ankle strap, the velcro securing the stash is super grippy, so you can be confident knowing you won’t lose the keys if you do fall off. With this bag, you can fit everything and a little more. I have no trouble packing the board, paddle, pump, leash and even things like my drink bottle and towel in. Those who enjoy getting a little bit off the beaten track will also enjoy the padded straps loaded with support for your shoulders and back. It means you can carry your SUP in and pump it up right next to the water! Some other bags are only good for storing your boards and getting them in and out of the car. 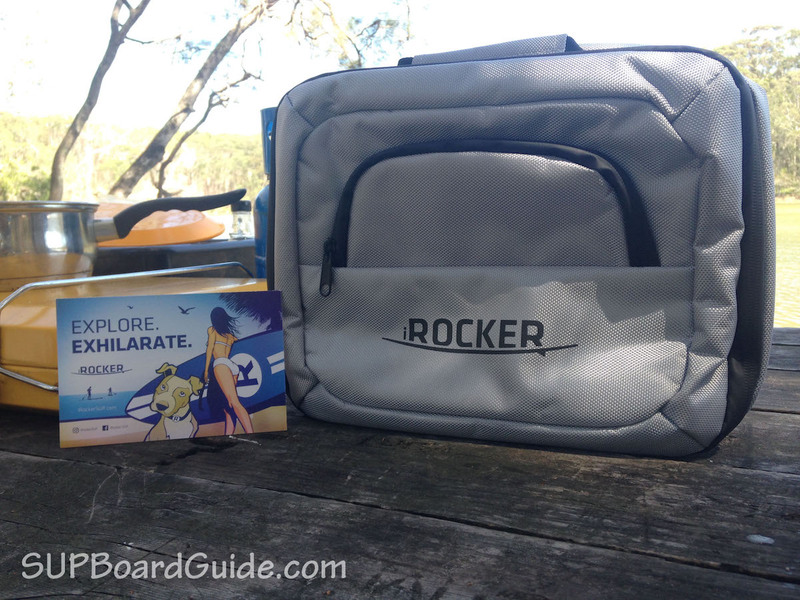 These iRocker bags, however, do give you the option to go a little further. The upgrade with an extra handle has made it even more portable. It’s those little things that really pack the value in. Kayak Bundle – If you would also like to use your SUP as a sit on top kayak you can purchase the kayak bundle separately. In the bundle, you’ll get a seat that has a little pouch on the back for storage. This seat simply attaches to the D-rings in the center of your 11’ All-Around. You also will receive an extra paddle blade which goes in place of the handle on your SUP paddle. In a few minutes, you’ve just gone from SUP to kayak! Stand Up to sit down! 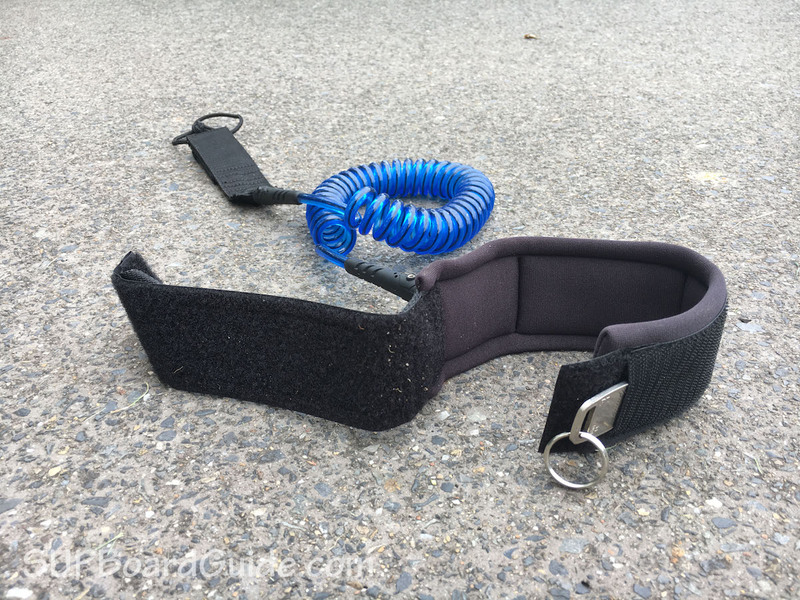 Carry Strap – If you are finding your SUP tricky to carry perhaps a strap will be easier. The branded iRocker strap is actually comfortable to use too. It’s got a rubber bottom and doesn’t cut into your shoulders like some other material ones. Insulated Lunchbox – Feeling snacky? Then perhaps the iRocker insulated lunchbox is a good idea for you. It clips onto the bungee cord easily and not so easily persuaded to come off. Which is a good thing – you don’t want your lunch floating away. 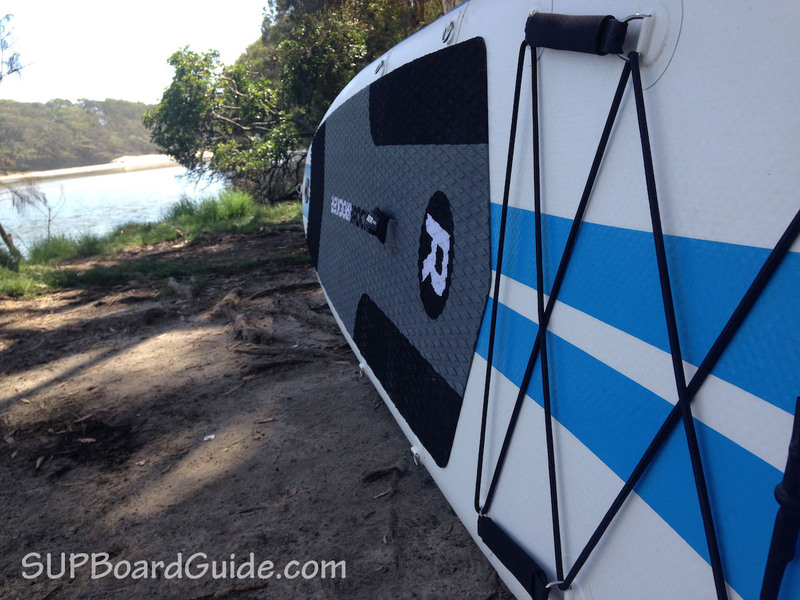 The 11’ All-Around is a fantastic board that is best suited to beginners and bigger riders for flat water conditions. As an entry-level board, it’s also extremely affordable and has everything you need to get started. 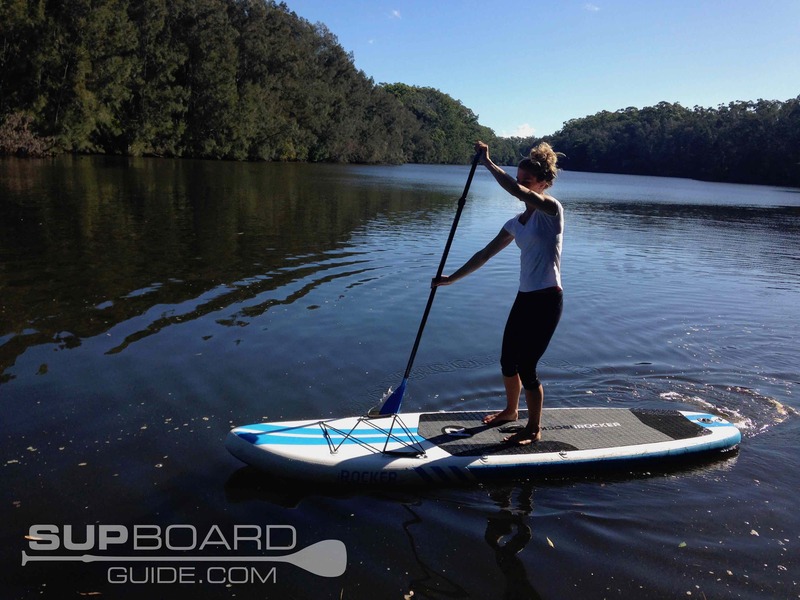 If you are looking for a SUP that performs better in the surf as well as flatwater, then take a look at the Sport. It’s definitely not as stable though so if you are starting out just be aware of that. The value here is that the accessories are made to last and easy to use. No flimsy pieces of plastic that will break after a couple of uses or heavy paddles that will give you blisters. Then on top of that is the board itself. The new extra layer of PVC makes for a tough and durable shell that will keep you on the water for seasons to come. Being so big, it’s also a perfect option for families who may want to take their kids or pets. If it’s the kids, there’s also the new handles on the bungee for them to hang onto. Another advantage of the size is for SUP Yoga or other sports like fishing. Though if you don’t need the extra capacity, the 10’ All-Around will probably be easier for you to paddle. It’s the same width and fin setup, so the stability is not much different. Even if you find it a little less stable than an 11’ when you first get on, you’ll be used to it after one paddle. 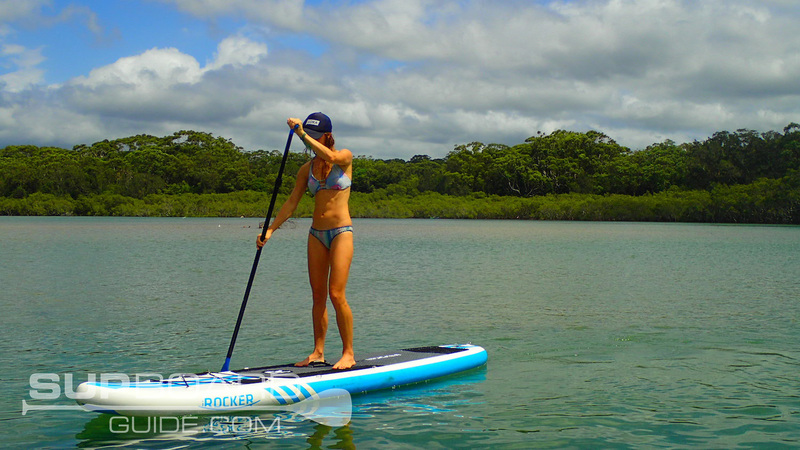 You’ll get more out of being able to control your SUP with ease in the long run. Very nice review. But everytime I read one I don’t know wich one to choose. They all look great. I’m 135 lbs, 5.44 feet and my friend 176, 6.13 feet. 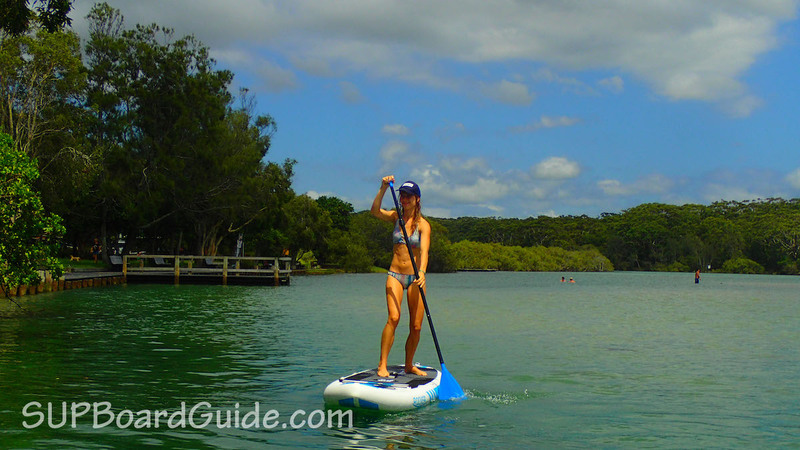 We would like to sup on lakes and make daytours. We don’t know witch one of the irocker or blackfin to choose. We know how to sup and we don’t want it to be to easy. (More wide is also more easy?) We like to have some exersice. Is a 35′ wide not to wide for a female? Do you have any advise? 🙂 We both want to buy a sup/differend sup. thanks a lot! We’re going to shoot a video soon to explain the full range. Especially with the new Blackfin boards people are a bit overwhelmed. Wider boards are generally more stable and not as quick. 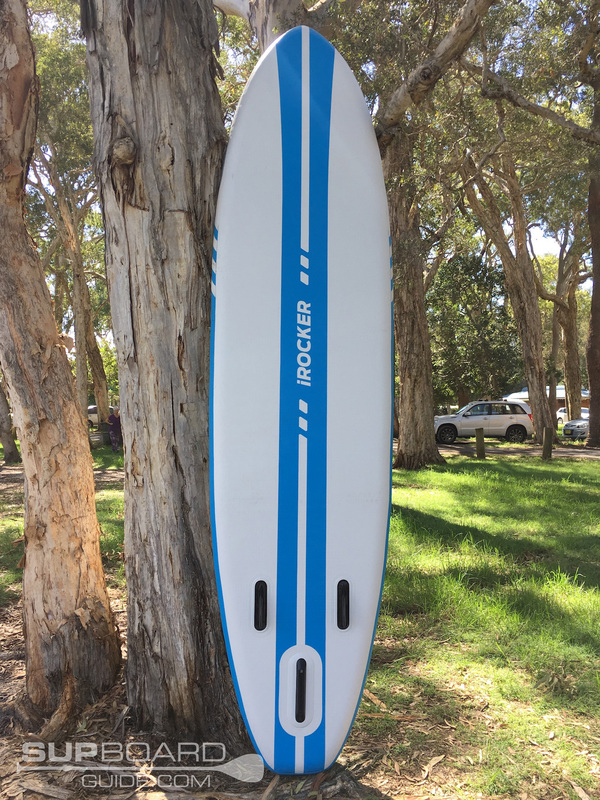 The iRocker Sport is the quickest board in the iRocker range. It’s perfect if you want to cover longer distances. The All Around isn’t as sporty as you can see in the shape. It’s also 2″ wider. More stability and easier to handle. 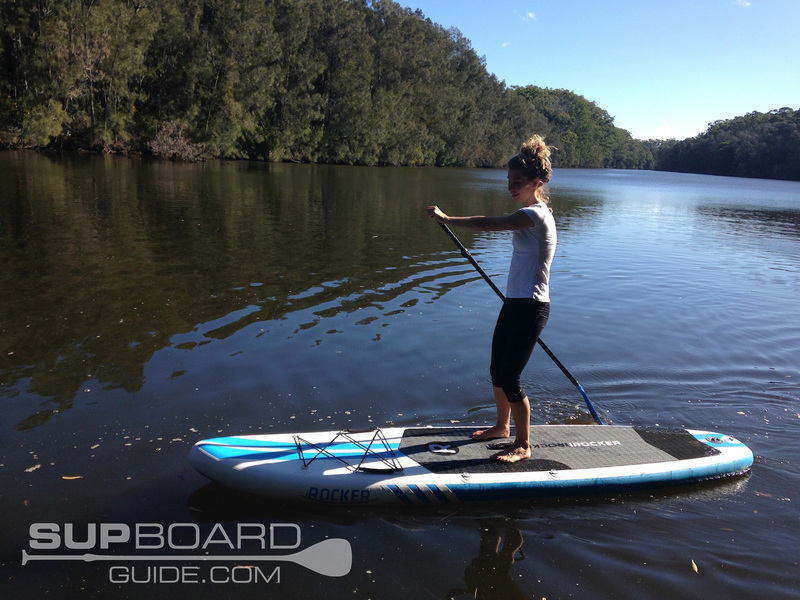 The Cruiser is the widest iRocker board and it’s for relaxed paddling or people that want to do yoga etc. It’s also super family friendly because kids will find it stable enough and you have plenty of space for extra passengers. The Blackfin boards are also really wide but they are basically the luxury version of the Cruiser. Since you want something for lakes and daytours I’d suggest the Sport for you and the Thurso Expedition for my friend. 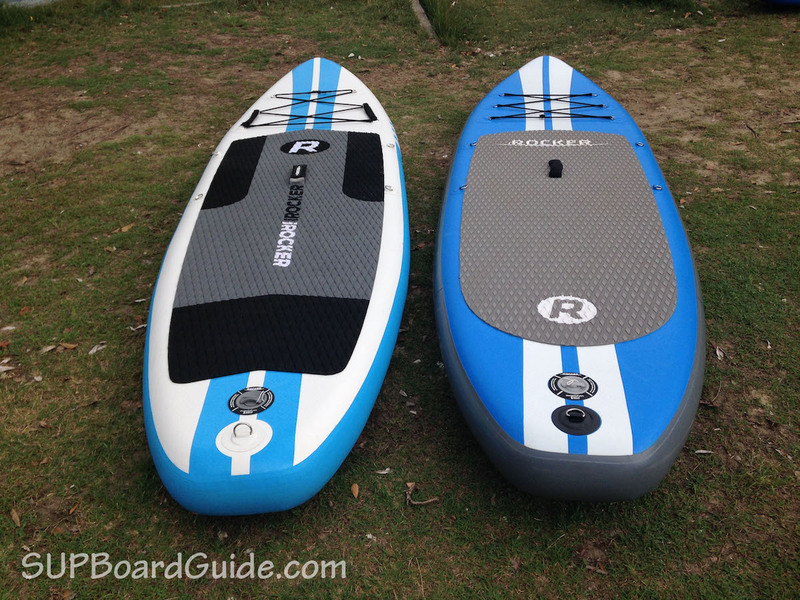 Both are really performance oriented and 2 super interesting boards to try out. Plus they are boards you can enjoy for years and won’t get bored with. Same price also. Thanks so much for the reply. The thurso also sounds good. 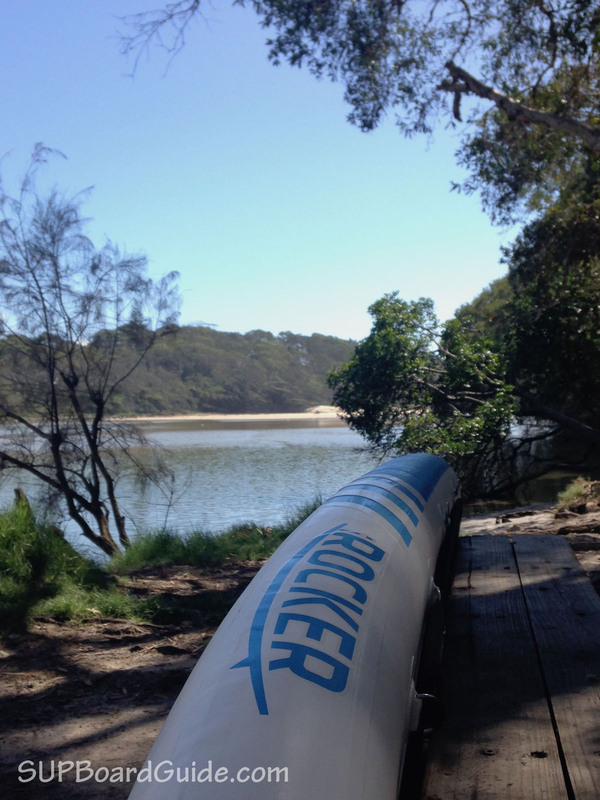 Would the waterwalker 11′ be something for me compered to the sport irocker? I read something about the bad quality of the backpack of the irocker sport. Or did they changed that already? And I like the carbon paddle. We live in the Nefherlands and I don’t know if we can buy the thurso. If we can’t what will be a good alternative one for my friend? Thanks! You’re welcome. The old Sport came with a mediocre backpack. That’s been changed though. 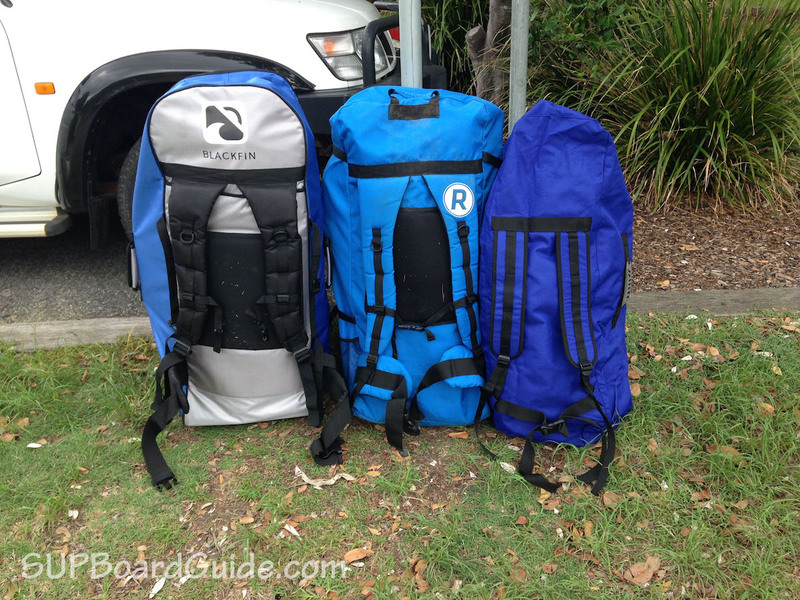 iRocker upgraded all their backpacks in 2018. If you look at the “backpack” part in our 2018 Sport review you will find pictures of the old and new backpack. 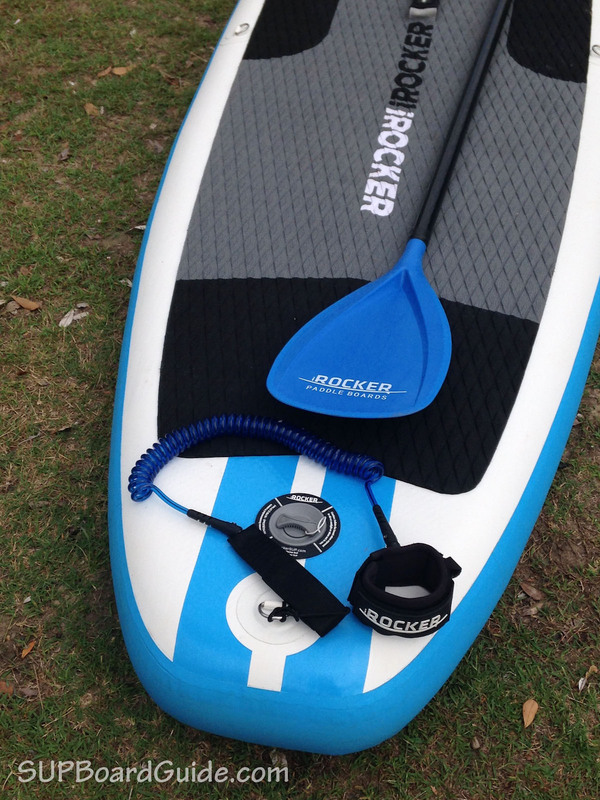 iRocker also has the option to upgrade to a carbon paddle. The Waterwalker is definitely an alternative. You can find it on amazon here. It’s Amazon.de but they do ship to the Netherlands as well. Thanks a lot for all your answeres. One last question. The expedition is not sold to the Netherlands. If we would choose between thurso waterwalker 11 and irocker allround 11. Which one is than the better option/ best board? And wat is the big difference in cruising on the lake between the Water walker 11 and 10.6? Thanks! The difference between the 11′ and 10’6″ is that the 11′ is a little faster. You get more glide with a longer board and it also tracks slightly better. A shorter board, on the other hand, is easier to turn. I am just before purchase one of iRocker all-round board. I just have one doubt – which size will be better. Could you be so kind and help me to chose the right size. I am 6’0” and 174 lbs and it seems that 11″ model will be better but I would like to have board which is more “agile”, easier to maneuver. From time to time my wife will be using it and occasionally I will take on board 3 years old son. Thanks for all the reviews. I have gone through all of them 🙂 Now, I have a question. 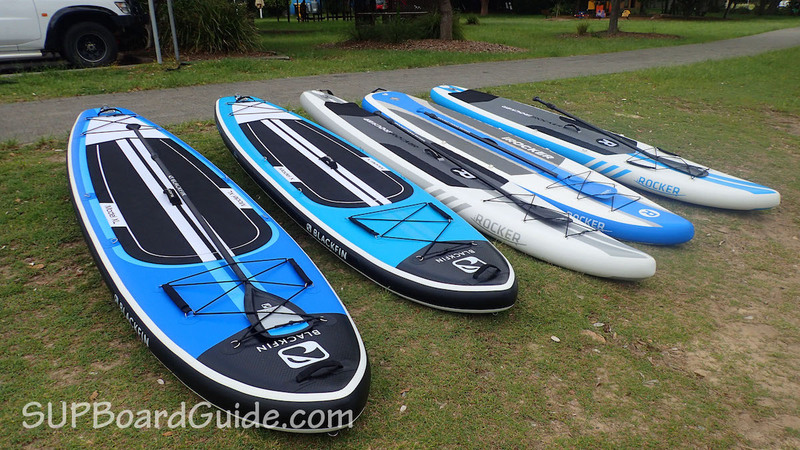 I am a beginner SUP rider, but I have rented them on a couple of occasions before. I am 5’10” and 165 lbs. I think I am ready to buy my first iSUP. I have shortlisted iRocker All-Around 10′, 11′, Blackfin X, and Tower Adventurer 2. I would be mostly taking it out on lakes, and maybe sometimes in the bay. No surf. What should I get? I love Model X for its build, but will it be too slow compared to the others? If I go with All-Around, how do I choose between the 10′ and 11′ versions? Also, are you guys planning to review Atoll? That was another board that I was looking at. sorry it took so long to reply. I completely missed your comment. So personally I’d prefer the All-Around or the Model X. Both come with better accessories and are higher quality than the Tower. The Adventurer 2 was a great board when it was released. That’s some time ago and iRocker managed to improve their boards every season so far. Tower staid in the same place and failed to innovate. All they’ve done lately was release the same board in different colors. Don’t get me wrong, it’s still a solid board but not quite on the level iRocker is at in my opinion. Choosing between the Model X and the All-Around I’d say it depends what you want to use it for. The Model X is perfect if you want to bring extra people like your kids or a dog. It’s crazy stable and comes with awesome accessories. They also used slightly higher quality materials. I’d say it’s ideal for families. This is really a great review you wrote about the iRocker 11′ Allround. I really want to buy an iRocker but I still need some decision support, maybe I can get help here. I can’t decide between the 11’Sport, the 11 ‘Allround or the 10’ Allround. I want to use the board on lakes, rivers and also on the sea. Sometimes I also want to go on longer tours. However, I also occasionally want to take my kids or even the Kids themselves want to go with it. I would like to have a combination of allround, touring and sport. What would you choose? Or should I better choose the premium line Blackfin? I guess an important factor to consider is the combined weight of you and your kids. I wouldn’t recommend the Sport for what you’re after but the 10′ or 11′. 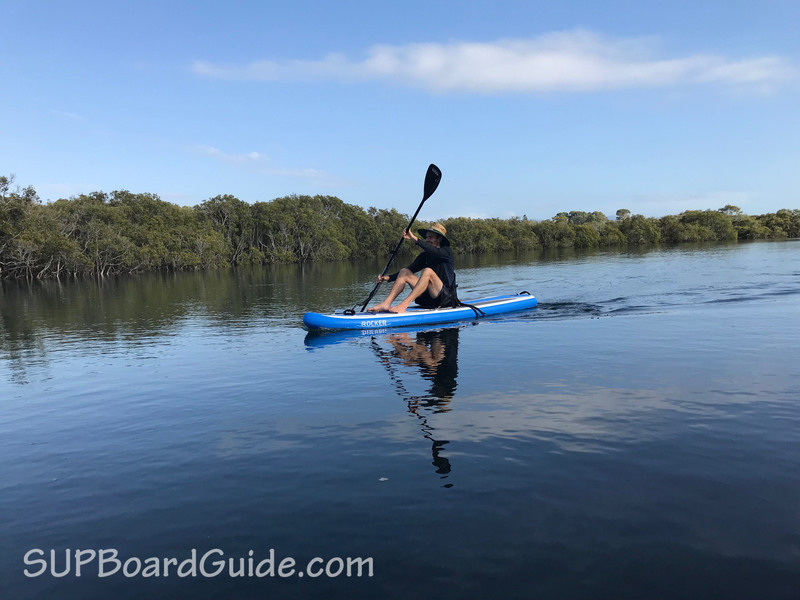 The 10′ would be easier for your kids to paddle as well as more versatile for sports options but you just need to check your combined weights against its max capacity. The Blackfin range is great but also very wide, so if you are talking about small wave surfing when you say Sports, they are trickier to manoeuvre. Kids, again, depending on how big they are, may find it hard to paddle. If you want to stick in that price range well then I would suggest the 10′ All-Around would be great for you. They really are producing the best board for value in that price range. Like in this review, I mentioned the ERS is a much better All-Around as far as performance goes, but it’s up to you. The only thing I would note about whitewater on the irocker is that it’s centre fin isn’t interchangeable and it’s quite large. So depending on how shallow it can get in some areas you go, it may be a hinderance. Whereas the ERS you can swap out for a low profile fin and they are also flexy to avoid damage. The ERS won’t be as stable especially with a dog is the downside. The Blackfin models have FCS fins, so you can play with that but they are HUGE, like really wide so not as versatile. Fun boards though. A hybrid between them and the All-around would be perfect right! Hey Steve, I’m sorry to hear that! It is a bit of a workout, but I don’t need to use my whole weight like that. But seeing as I use my SUP’s a few times a week, I have a compressor now too! It’s well worth the investment. And was this purchase done before they introduced their dual chamber pump? Any suggestion for both of us? I think either of the two boards will be great for where you want to go and your sizes. The All-Around will give you a little more diversity as you grow into the sport but the Cruiser will be the most stable for when you start out. So it’s up to you 🙂 Good choice too because iRocker give you $80 off when you buy two boards! I was thinking of the Blackfin X but have been doing this for a while and want something lighter, more nimble, easier to roll up, and not such a huge bag. I ride mild whitewater, and like to paddle around the lakes. 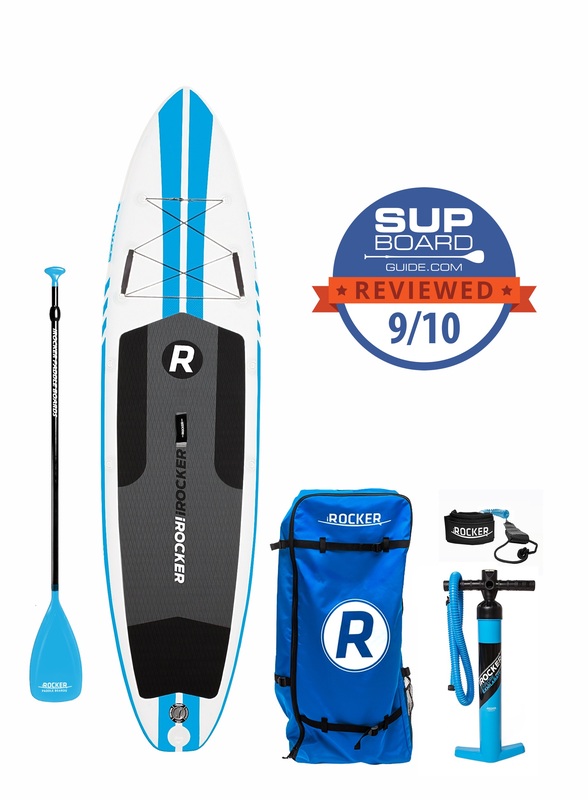 I have the iRocker Cruiser that I love for yoga and whitewater but it’s slow on the lakes, which is why I’m looking at the Cruiser. How do the 11 foot and 10 foot All-around boards compare in terms of speed and maneuverability? I’m a little confused, you said you have the Cruiser but you’re looking at the Cruiser haha, do you mean looking at the Blackfin X? And when you ask about the 10/11ft, do you mean in comparison to each other or in comparison to the Blackfin X? Thanks for all of the awesome reviews! I am debating about getting irocker 10’ all around vs ERS Skylake 10’7 but really don’t want to bust my budget on this. I am 5’8, 155 lbs. I live in Hawaii and will mostly be doing my paddling in ocean water with some light small waves. I recently tried the 11’ Bodyglove Performer 11 and found it difficult to control in the ocean compared to other traditional SUPs I’ve tried in the past. I still want an ISUP due to limited space. I will be using it for mostly leisurely paddling. 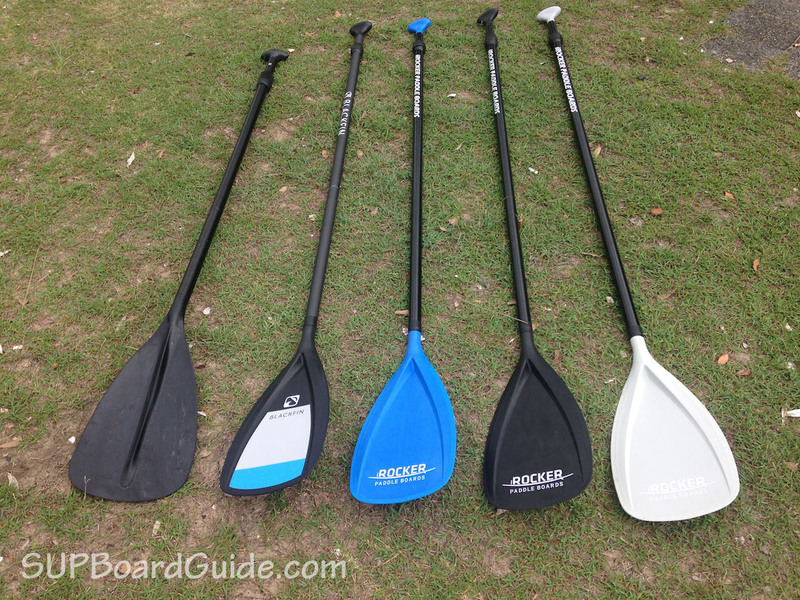 Do you recommend the irocker for mostly calm ocean paddling (not surfing) vs other choices? Sorry for the delay, had a bit of a break over the Chrissy period! I would recommend the ERS Skylake over the iRocker for small waves definitely. Especially if you are used to using hardboards in the ocean. The iRocker is thicker and so it’ll be a bit tougher turning and maneuvering, which I believe the Bodyglove is also 6″ thick. The ERS also uses fusion technology in its materials so it’s a lighter board, which again, makes it more responsive. I’m torn between the All Around 11′ and the 10’6″ Cruiser. Bulk of the use will be at the beach on mild wave days. I’d like to be able to do some some yoga too. I have decent stability. Is the All Around stable enough for yoga as well even though it’s slightly more narrow? I like the front hand holds on the All Round but wish it had a tow handle to like the Cruiser. I’d prefer the board to ride like an Epoxy so I’m happy to hear about the new release having a more rigid structure. How do you like these compared to Isle Explorer? First of all, thanks! Second of all, sorry for the slight delay in response. Try reply to comments pretty quickly but the holiday season consumed me! If you are used to riding SUP’s or as you say, have decent stability, you will be fine 🙂 I have done some basic poses on the all-around from memory. No inflatable will ride like an epoxy in conditions like small waves, not even the top of the line Red Paddle Co’s. 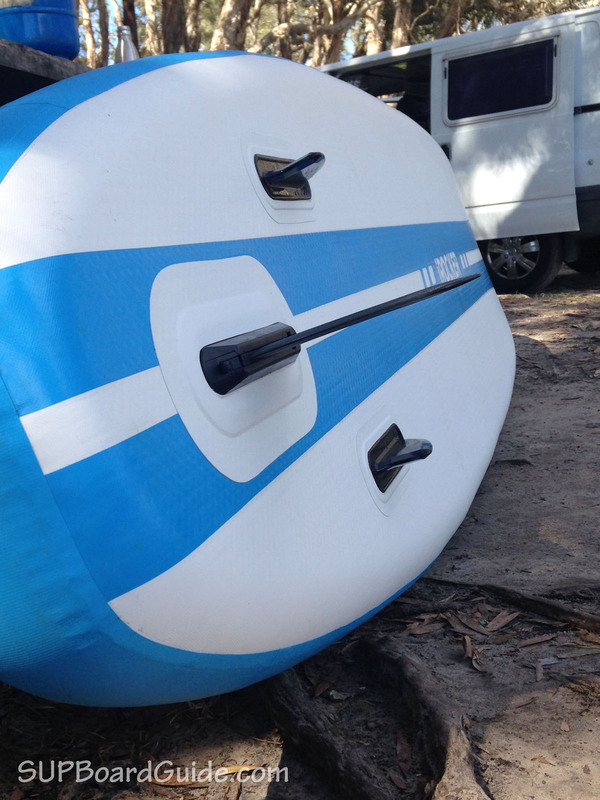 But, for casual paddling, you can definitely find inflatables with similar performance to hardboards.